The closure of the Calais jungle commenced on 24 October 2016. A year on from this, we ask – what has been achieved? Firstly, have migrants stopped coming to Calais? Answer: a clear ‘no’. There are currently around 1,000 refugees sleeping rough in and around the Pas de Calais area, and the reasons for this are the same as they have ever been: if a refugee wants to claim asylum in the UK they need to be physically present in the UK to do so however, there are no safe and legal routes for them to get here. This forces vulnerable people to risk life and limb using illegal and often dangerous means of entry. Refugees therefore gather at points of transit near to the UK such as Calais, Dunkirk, Brussels and Zeebrugee. Did the French welcome centres provide better living conditions for the refugees? Answer: yes and no. There is no doubt that some refugees benefited from this move. Some of the centres were a significant improvement over jungle living conditions, and some refugees were granted French asylum. However, some of the centres were not great at all, offering only hastily made arrangements with insufficient food, no medical or legal support and mass opposition from the local population. Many refugees left these centres, including many of the unaccompanied minors following the halt, in December 2016, of the UK government scheme to transfer them to the UK. What are conditions like in Calais now? Answer: Worse than they have ever been. With no camp, people are sleeping rough with no protection from the elements, highly inadequate sanitation and an irregular food supply. The effect on health and mental health is devastating. Medics report that scabies, fungal infections and gum infections are at an all time high due to people’s inability to wash themselves or their clothes. Strength and vitality is swiftly worn away by cold, lack of sleep and constant fear, and depression and anxiety are everywhere. We are deeply concerned about how people are going to survive the coming winter under these conditions. 1. Firstly we have come full circle back to the position that Calais was in in March 2015 when the original ‘jungle’ was created. Then, there were migrants sleeping in various locations in and around the town, and the local residents didn’t like it. At that point the migrants were all asked to move to one out of town location (Jules Ferry) and told that if they moved there they would not be evicted. That is how the Jungle started. So we have come full circle to where the town was in March 2015, but now there are 750 migrants there and then there were 400. 2. Secondly a rough geographical split has been created between refugees who are trying to get to the UK and those who want to claim asylum in France. The ‘old’ Calais jungle was home to both, as people claiming asylum in France cannot afford to live in houses and so many were biding their time in the Calais jungle until their papers came through. 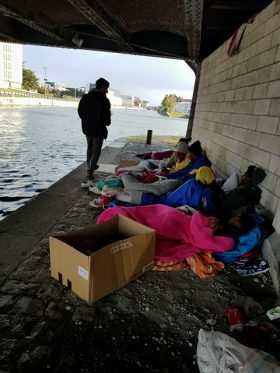 The French authorities have now made it virtually impossible to claim French asylum in the vicinity of Calais, so refugees in this situation are now more likely to be found sleeping rough in or around Paris, in camps such as Metz, or in a French welcome centre. There are currently between one and two thousand refugees sleeping rough around Paris and about 400 in Metz. This keeps numbers in Calais lower. 3. The third big change is the number of deportations made by France under the Dublin III system – the system that says that a refugee must claim asylum in the first ‘safe’ country in Europe in which they arrive. In practice this is usually either Italy, Greece or Bulgaria. Since the closure of the jungle the French authorities have significantly increased the number of deportations to Italy, the most common port of entry for migrants living in France. The issue here is that there are over half a million refugees living in Italy, and the Italian economy is struggling to support them. Refugees in Italy are totally unable to find work or any means to support themselves and are living destitute in the streets – sometimes unable even to eat – effectively rendering asylum in Italy worthless. There is no answer for these people as Italy can’t support them but having been ‘fingerprinted’ in Italy they cannot claim asylum elsewhere in Europe. This is becoming one of the worst issues aid agencies are now seeing in France. People who are ‘lost’ in Europe with no hope of asylum but they can’t go back to their home countries for fear of death/persecution/torture etc. There are approximately 750 refugees in Calais, 250 in Dunkirk, 400 in Brussels, 1,500 in Paris and 400 in Metz. That is over 3,000 people living in the worst conditions we have so far seen in France. However, whatever France’s failures, it should not be forgotten that the UK bears a responsibility here also. Based on both the number of asylum seekers per head of population, and the number in relation to GDP, the UK has taken well below the average number of refugees hosted by other countries in Europe(1). There is no morally acceptable reason why we should do so much less than the rest of Europe to help in this, the greatest humanitarian crisis of our time. This time last year, the UK government promised to take in 3,000 child refugees, but only 750 were in fact transferred. At Care4Calais we see every day the great amount of will that people in the UK have to help those in desperate need through no fault of their own. All that we ask is that our government allows those of us who want to help, to do so.